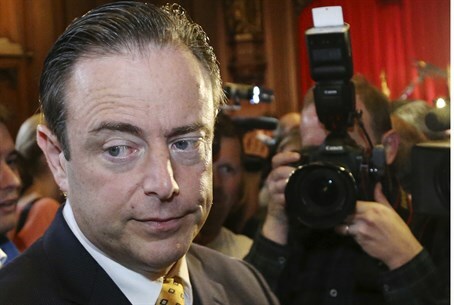 Right-wing Flanders leader Bart De Wever has disowned Flemish nationalist collaboration with the Nazis in World War II, still a hugely sensitive issue in a sharply divided Belgium. Allegations of collaboration by Flemish nationalist parties, forerunners of De Wever's own New Flemish Alliance (N-VA), regularly stoke tensions with Belgium's French-speaking community in the south which takes pride in its WWII resistance to the Nazis. "My own grandfather was a member of the VNV (Flemish National League), the nationalist party which collaborated massively," De Wever told a Holocaust commemoration attended by members of the Jewish community in Antwerp, where he is mayor. "I want to look at this straight in the eye. This collaboration was a terrible mistake, on all levels," he said late Wednesday on VRT Flemish public TV. "This is a dark page in history which Flemish nationalism has to look at squarely and never forget. "Nazism and the Shoah were criminal mistakes. Nobody can deny and there is nothing to soften it," he added. The N-VA emerged as the single biggest party after Belgian elections last year and joined a coalition government led by French-speaking Liberal Charles Michel. De Wever however chose to stay out of the federal government, preferring to remain in his Antwerp power base and to continue to push for an eventual independent Flemish state. Shortly after the elections, Jan Jambon, a close aide of De Wever who was given the interior ministry post in the new government, sparked outrage by suggesting WWII collaborators may have been justified in their action. De Wever himself angered the French community in 2010 when he accused them of historical amnesia over wartime collaboration within their own ranks. Many in Flanders believe that the purge that followed the liberation of Belgium mainly targeted Flemish collaborators while prosecutions were rarer in the French south.